Composed of: n°1 sofa 3 places - n°2 armchairs - n°1 coffee table. (Pillows included). Dimensions visible in the product images. Available colors: White, Brown, Dark grey. 1 265,00 € tax incl. Since ever, the care to the details in all articles Siesta Exclusive is excellent, in the Rattan line this important target it is even more evident. From the undeniable charm and provided of design extremely refined, the MONACO LOUNGE SET XL (here in the version 5 places), is able to donate great elegance and exclusivity to your relax area. 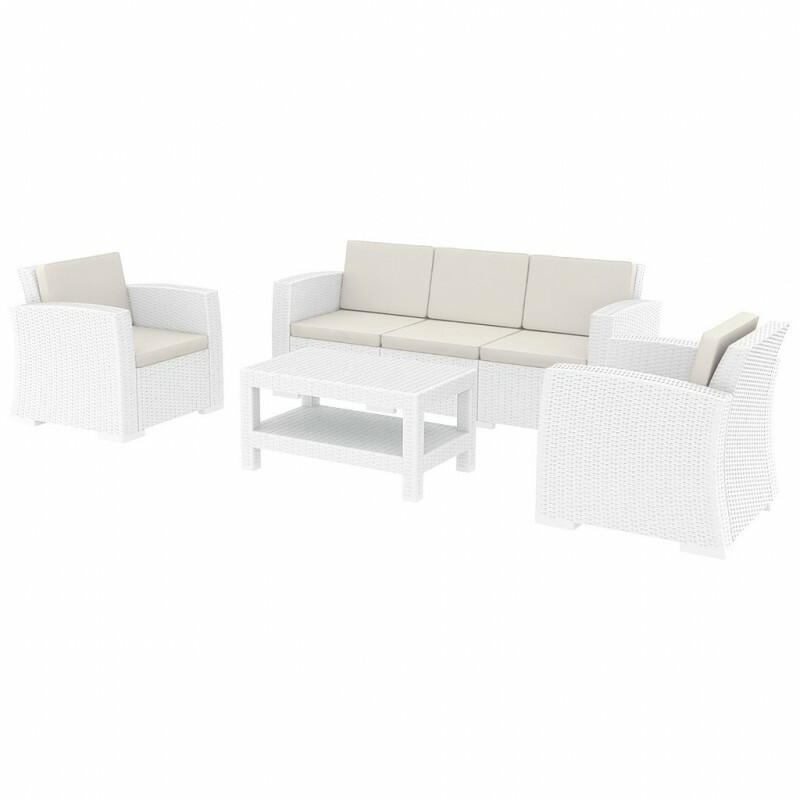 Built in ecorattan, MONACO LOUNGE SET XL, it is extremely comfortable as well as having a significant visual impact, the best solution to furnish with class your outdoor space and more. Designed to ensure an easy mounting, (see video and assembly manual), MONACO LOUNGE SET XL it is made in resistant resin of polypropylene, reinforced with fiber glass without any metal parts. Be noted that this article is also equipped with treatment in defense of UV rays and protection against atmospheric agents. The Set is provided with soft cushions with 7cm thickness, covered in polyester fabric (not waterproof) beige color and finished with Pass-poil finishing of the same color. The pass-poil it's a process that involves the insertion of a border in Ultrasil for all the perimeter of the cushion. We remind you that the sofa can have, on request, extensions to increase the seating (4, 5, 6, etc. ), to find out more CLICK HERE. For indoor and outdoor use. ideal item also for contract projects.